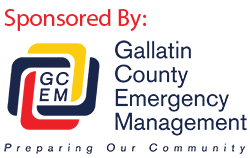 Tuesday afternoon at 4:00 the Gallatin County Sheriff’s Office received a request for a backcountry rescue in the Beehive Basin area near Big Sky. The 911 caller advised that a 67 year-old female, who had prior heart conditions, had collapsed on the trail. The woman was conscious and breathing, however she had an elevated heart rate, and it was not slowing even after taking in food and water. The Big Sky Division of Gallatin County Search and Rescue responded along with air ambulance Air Idaho. An EMT that was on scene assisted Air Idaho with locating a landing zone and the patient was flown to the Bozeman Health Deaconess Hospital. Thanks to the reporting party having a sufficiently charged cell phone and having cell service the Sheriff’s Deputy Incident Commander was able to communicate on a regular basis regarding location and patient status. Sheriff Brian Gootkin would like to remind backcountry users that medical conditions that might easily be managed in town can become life threatening in the backcountry. Know your limitations, know the country and take a partner when you are enjoying the hills of Gallatin County.